Famed for their vicious and violent raids, the Viking warriors were travellers of the sea and masters of the land invasion. There is nothing fake or false about the raids of the late 8th century AD, there are many written records detailing the effects of the Viking raids. Tales of brutality, massacres and burning are commonplace where the Viking warriors landed ashore, leaving nothing in their wake but destruction and mayhem. In the beginning the Viking people had a reputation as legitimate traders and merchants. The islands they visited were traded with fairly and in most cases peacefully. This began to change however in the late 8th century the raids began in earnest, with the Vikings moving further afield and over a period of two centuries the Vikings earned a fierce and violent reputation. There has been much speculation as to the reason for the Viking raids, did they raid to survive or was their a greater force in effect that was causing them to suddenly switch from being reasonable traders to ferocious raiders. The first reasoning for the increase in raids, was simply a lack of land in their native Scandinavian homes. while most of Scandinavia is not as suitable for farming as other countries it wasn’t exactly short of space, but this could still be a valid reasoning. A Viking longship carrying a Viking raiding party to foreign shores. Another reason could be a massive population boom, with only the eldest son inheriting their fathers farm, the youngest may have felt the need to travel. If this was the case then it could explain why they would raid and then make a home on the new land. A lack of profit in the established Viking trade routes could have led the Vikings to pursue their future wealth through more violent means. Many historians actually believe that the trade in Europe could have reached a low point in the Viking era lending credence to this theory. With their trade knowledge of much of Europe, it could be the Viking simply used their trade knowledge to plan and organise future raids. Another similar line of thinking is that non trading Vikings received the country knowledge from traders and took a violent approach to their trading routes. The Viking raids began as trial and error attempts. The Viking warriors were simply testing the water so to speak and the only goal was to find treasure and gold and return home. Later the raids would become well planned exercises with an increase in boats and warriors travelling the oceans. The main tactics would still remain the same however, shock tactics were the order of the day, with the Vikings using the element of surprise to their advantage. The Viking warriors being of a pagan religion that did not accept or know of Christianity would often attack monasteries in Britain. Of course, a monastery was an easy target for a raid, they often had plenty of gold and jewellery and fine treasure, and were men of peace meaning that they had little to offer a true Viking warrior in a fight. Later in their larger scale raids the Vikings would travel in huge numbers and still try to strike with the speed needed to gain the tactical advantage. 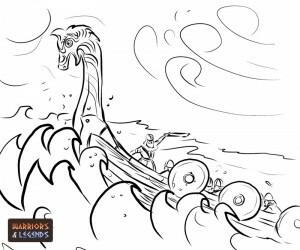 The raids of course would not have been possible without the means to travel to other countries, and the Vikings used their majestic longships to cross the seas and oceans. Intricately constructed and build large enough to carry a large raiding party, the Viking longships were an essential component of the Viking raids. The benefit to the shape of the longboat was its ability to ride high on the ocean. The design of the longboat shape allowed the Viking to ride onto the beaches and shores of their targets. Affording them the element of speed and also surprise. The longships or longboats used by the Vikings typically came in three classes, Karvi the smallest class, Snekkja the middle sized boat, and Skeid the largest of the Viking longboats. What countries did the Viking warriors raid? The Viking warrior raiding parties travelled near and far afield, and the countries they plundered were many. Below is what we believe to be a complete list of countries and island they raided. The real reason for the sudden switch from trading with their neighbours across the oceans, to raiding and attack will likely remain a mystery forever. What we do know however is how ferocious and brutal the Viking raids were. The pagan religion the Vikings followed rewarded brave warriors, and this may have given the Vikings plenty reason to care little for the foreigners they murdered, plundering their treasure and taking slaves.